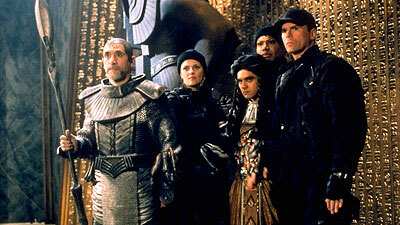 Trapped on a Goa'uld attack ship headed for Earth, SG-1 prepares to destroy it until they are joined by a second ship. As Earth braces for an attack, SG-1 joins forces with Master Bra'tac, who is also on board, and plants explosives to destroy both ships and save Earth. In the ensuing battle, Daniel is badly injured and makes his way to the stargate as the rest of the team barely escapes in death gliders before the ships explode. Earth is safe, but a space rescue from their suicide mission seems unlikely, until the shuttle Endeavor appears on the horizon. Part two of two. Lt. Colonel Samuels returned to SGC by order of the Joint Chiefs, at the request of Senator Kinsey, to coordinate with the Pentagon for a pre-emptive strike. Goa'uld shock grenades cause extreme pain, unconsciousness and temporary blindness. "Goa'uld Buster" prototype weapon developed at Area 51 under Colonel Samuels and Colonel Maybourne, uses a Mark 12A warhead, enriched by naquadah brought back by an SG-5 mission, and yields in excess of 1000 megatons, to be launched from Vandenberg Air Force Base. Goa'uld attack vessels are equipped with defense shields capable of withstanding 1000 megaton warheads. Among the Goa'uld, a pharoah's power is more often challenged by his sons than his enemies, a fact which Bra'tac can use to lead his wing against Apophis in Klorel's name. A sarcophagus can revive the dead. Once the Goa'uld ship was close enough to Earth, the stargate could be activated by using the Earth point of origin. SG-1 and the death gliders were recovered by the shuttle Endeavor. Bra'tac will return to Chulak.